PCP Ammunition Polymer-Cased Rifle/Machine Gun Ammo for Military Combat and Civilian Tactical/Commercial Applications: Has the Era of High-Heat-Resistant “Superplastic”/”Superpolymer” Cartridge Cases Finally Arrived? | DefenseReview.com (DR): An online tactical technology and military defense technology magazine with particular focus on the latest and greatest tactical firearms news (tactical gun news), tactical gear news and tactical shooting news. The Firearm Blog just published a short piece on PCP Ammunition rifle ammunition, which utilizes a polymer (i.e., plastic) cartridge case. DefenseReview (DR) also viewed this ammo at SHOT Show 2011, but based on all previous attempts by other companies/developers at polymer-cased ammo (including NATEC PCA-Spectrum ammo) failing, we're forced to be skeptical about it. DR will keep an open mind on it, though…a skeptical mind, but an open one. For the record, we're cautiously optimistic about this stuff (PCP ammo), since we're an optimistic bunch over here at DR.
PCP polymer-cased rifle ammunition will, according to the company, be available in 5.56x45mm NATO (5.56mm NATO)/.223 Rem. 6.8x43mm SPC (6.8 SPC), 7.62x51mm NATO (7.62mm NATO)/.308 Win., .338 Lapua Magnum, and .50 BMG. After looking the PCP polymer-cased ammo over at the company's booth, we ran into Master Sgt. Steve Holland, U.S. Army 5th Special Forces Group (5th SFG) (Ret.) at the SureFire booth, and Mr. Holland had some of the PCP ammo on him. Holland seemed impressed with it, but the proof will be in the testing and fielding. The primary raison d'etre (reason for being) for polymer-cased ammo is to reduce weight for the warfighter/soldier, but plastic tends to melt at the high heat generated by belt-fed machine guns and even select-fire/full-auto mag-fed assault rifles/carbines/SBRs (Short Barreled Rifles)/sub-carbines at high round count. Polymer, being a poor heat conductor, should theoretically keep the chamber cooler. However, it may not accomplish this as effectively in actual practice. What most people don't understand is that even though polymer cased ammo may insulate the chamber (assuming the case doesn't just melt) on each shot, as the barrel heats up, the barrel itself will end up conducting heat and transfering it to the chamber. Barrel heat build-up is the result of the friction caused by the rounds fighting their way down the barrel. With each successive round fired, barrel heat increases. As the barrel heats up, so does the chamber and weapon as a whole, eventually. While a brass case may transfer some heat to the chamber upon firing, it also absorbs and pulls heat out of the weapon upon ejection with every shot fired. Plastic/polymer can't do this. Once the chamber gets hot enough, plastic–at least all previously-developed plastic–will just melt and gum up the works, causing jams/malfunctions. The boys at PCP Ammo claim to have solved this little dilemma, though, with their own special-formula polymer. We'll see if the secret sauce lives up to the hype, or if there's a problem with the recipe. Hype is hype, and proof is proof–and we've been burned before. But, again, "optimism" is the word of the day, and shall remain our guiding light of hope, until and unless that hope is dashed violently and decisively upon the cruel rocks of reality and physics. Let's hope that doesn't happen, and that this new ultra-advanced polymer defies conventional polymeric physics. Theoretically, polymer-cased ammo should also be less expensive than brass-cased ammo, but, again, if this is some kind of super-duper magical wonder-polymer that won't melt at high heat, it could very well end up being significantly more expensive than brass. In fact, it could end up being prohibitively expensive, at least until economy of scale takes effect under high-order production. Defense Review doesn't yet have initial pricing info. Otherwise, we'd share it. 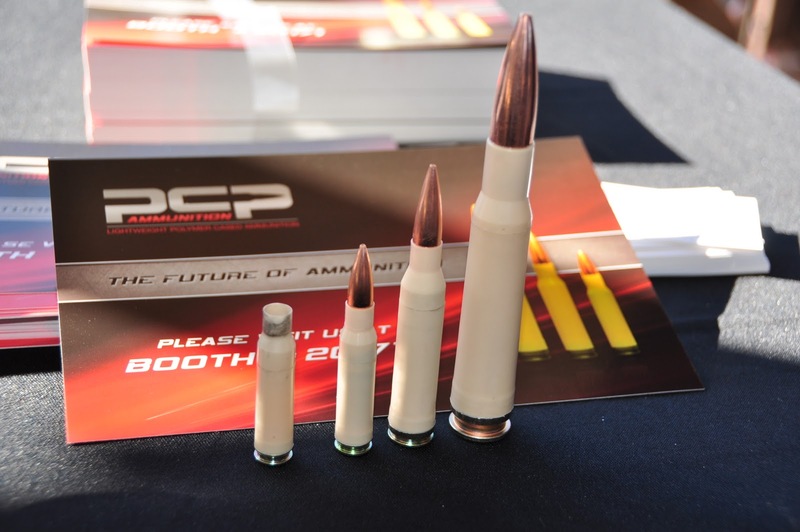 It's DefenseReview's understanding that the PCP Ammo rounds being developed are intended to be military grade for potential use by the U.S. military. If that's indeed the case, the PCP polymer-cased ammo will have to be able to handle the respective heat generated by military weapons like the FN M249/Mk46 Mod 1 5.56mm NATO LMG/SAW (Light Machine Gun/Squad Automatic Weapon), FN M240 7.62mm NATO MMG/GPMG (Medium Machine Gun/General Purpose Machine Gun), U.S. Ordnance Mk43 Mod 1/M60E4 Commando 7.62mm NATO MMG/GPMG, and LU.S. Ordnance M2HB-QCB (Quick-Change Barrel) “Ma Deuce” .50 BMG HMG (Heavy Machine Gun), which are all belt-fed machine guns designed to be fired at high round count under adverse combat conditions. It should be noted that PCP is also developing loads for the civilian tactical shooting market, i.e., the commercial market. One of these loads is a 5.56mm round utilizing a Sierra Match King ® 77gr Bullet, which is supposed to be equivalent to the Black Hills MK262 Mod 1 77-grain round. Perhaps PCP Ammunition is using some kind of super plastic, "superplastic", if you will. O.k., "superpolymer". If that's the case, and they've developed/invented a super-polymer-cased ammo family that can withstand the heat generated by full-auto firearms and not melt, AND that's reliable, AND that's adequately accurate, AND PCP can produce the new wonder ammo at either the same or lower price point than brass-cased ammo, then they'll probably do well, and should do well. DR would really like to get some of this ammo in 5.56mm and 7.62mm as soon as possible to run at the range.